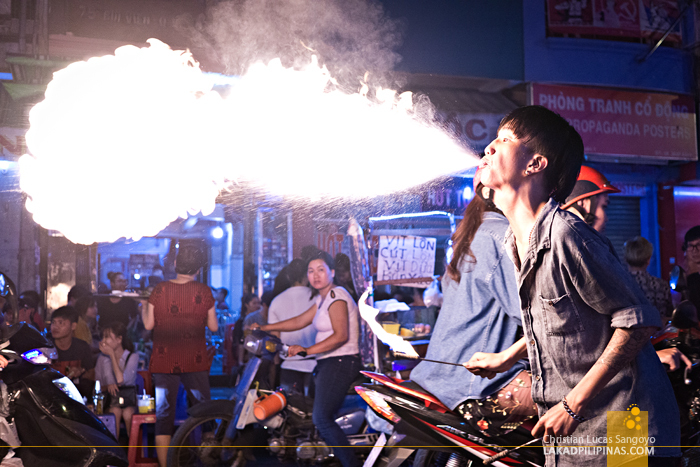 Amidst the clinks of beer bottles and laughter pervading the warm evening along Bui Vein street in Ho Chi Minh, a man haphazardly walked in the middle of the street, looked to the left, then the right, and seeing no policemen in sight, whooped up a trail of flame from his mouth. Dracarys, as Daenarys would say to her dragons. Mot, hai, ba, yo, or one, two, three, cheers, as they would say in Saigon. 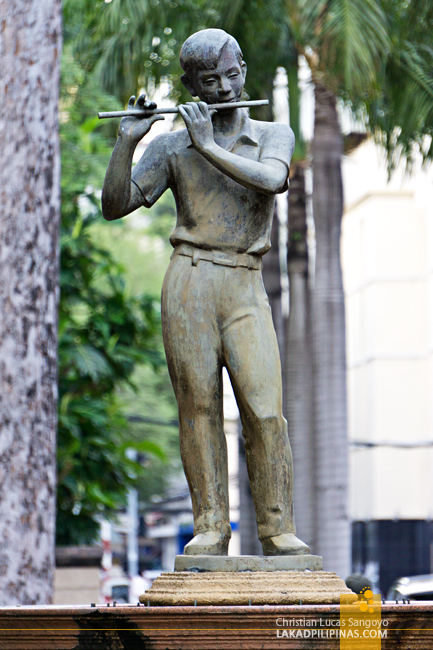 Even with limited time in the city for our two-month Same Same Summer Trip, we managed to squeeze in a whole day of walking tour around Ho Chi Minh on our second day. 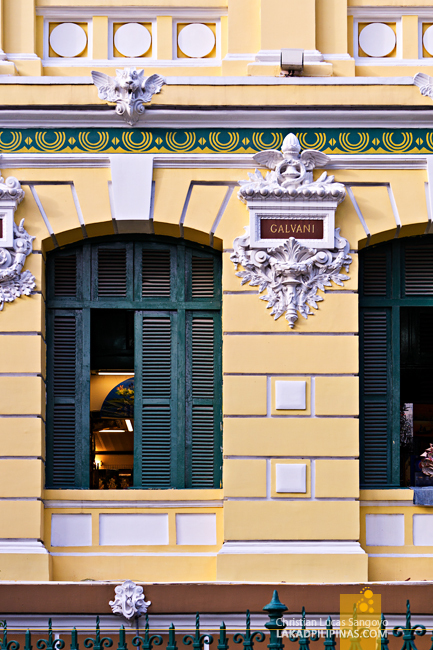 Our itinerary includes touching base with Vietnam war memorials and museums, stately French colonial buildings, shopping on bazaars and markets, and a beer or two at the city’s pub street to cap the day. 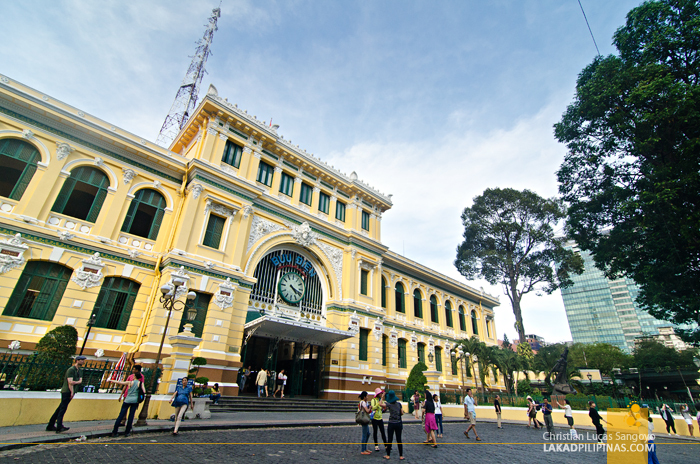 There are available Saigon tours that can be purchased along the backpacker district of Pham Ngu Lao, and there are even some online which we could’ve booked without the hassle of researching and planning [CHECK HERE FOR DISCOUNTED RATES], but since we were on a budget, we decided to do it DIY-style. We didn’t even bother taking the public transports in the city. We walked! And it isn’t really that hard. It is tiring, but not hard. We started from our lodging, a serviced residence in Pham Ngu Lao, early in the morning after having our pho and banh mi fix, and finished our do-it-yourself tour near the area with beer and chips. 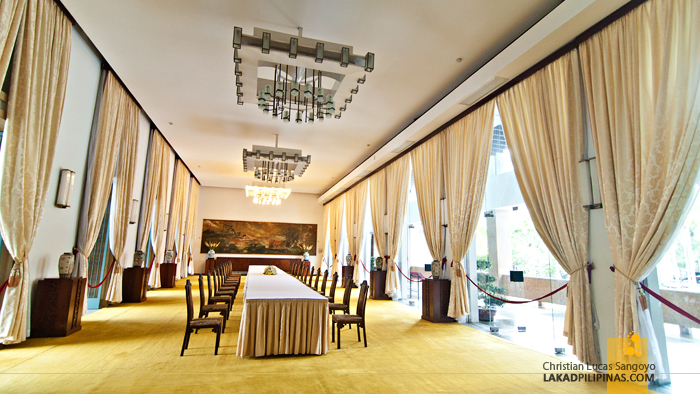 About twenty minutes from Pham Ngu Lao is our first stop for our tour, the Independence or the Reunification Palace. The actual structure is set on a sprawling twelve-hectare landscaped garden. 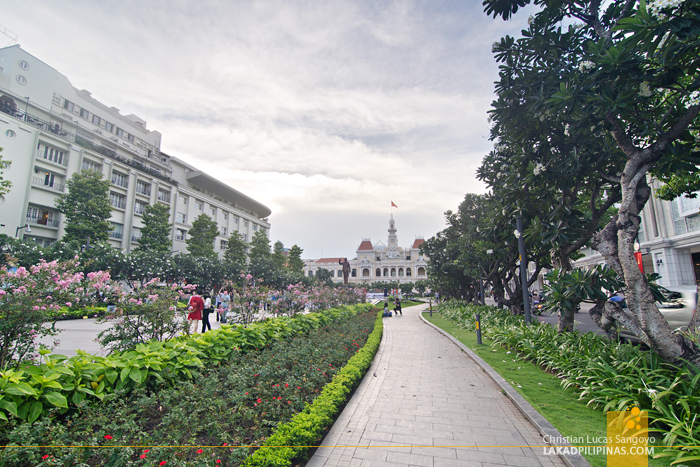 The palace, which doesn’t really look much like a palace, is one of the most historic buildings in Saigon. 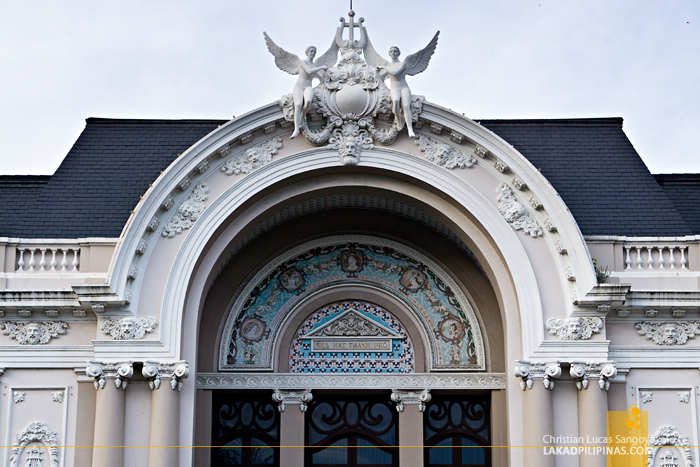 Its history goes all the way from 1863 when a wooden palace occupied the same lot. It was replaced by sturdier one by the French five years later and was eventually dubbed as the Norodom Palace. 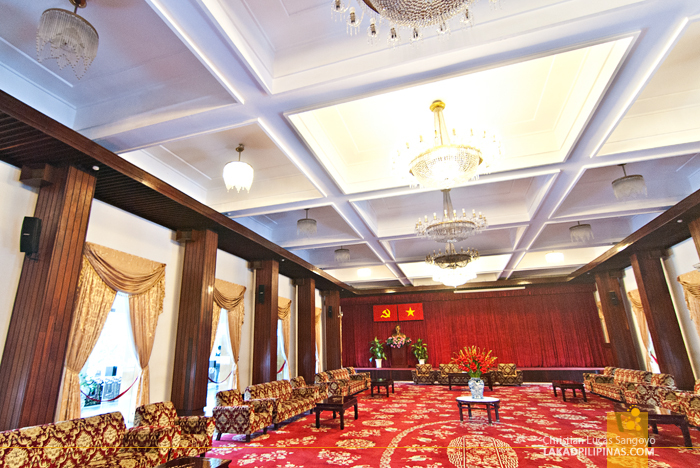 The building was used by the French governors of the land, the Japanese Imperial officers during the Second World War, and the seat of the State of Vietnam—South Vietnam’s anti-communist half. The palace was bombed in 1962, was demolished, and thus rose the current incarnation of the building. The Independence Palace is actually where the Vietnam War ended when in 1975, a North Vietnamese communist tank rammed its gates and ended the war. Visitors are actually allowed inside its halls, and you can see mostly huge rooms with very long tables and ornate furniture. Like its nondescript facade, it’s really not that interesting, but since we’re in Saigon, might as well drop in for a quick look. 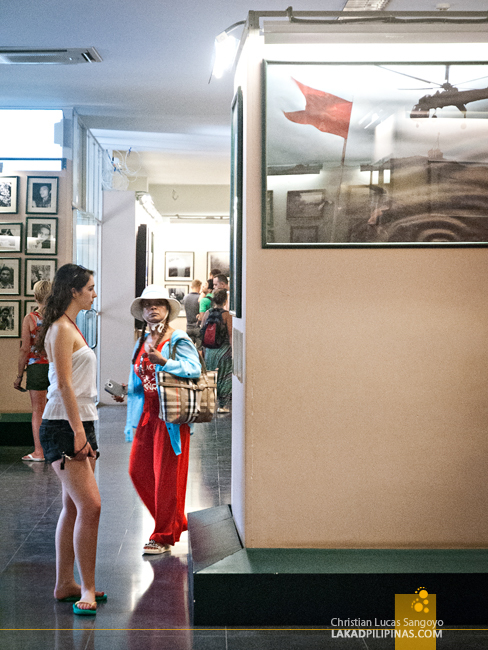 Eight minutes away from the Reunification Palace is the War Remnants Museum. Housed on a blocky modern building, which ironically used to hold the United States Information Agency, it is one of the most famous museums in the whole of Vietnam. 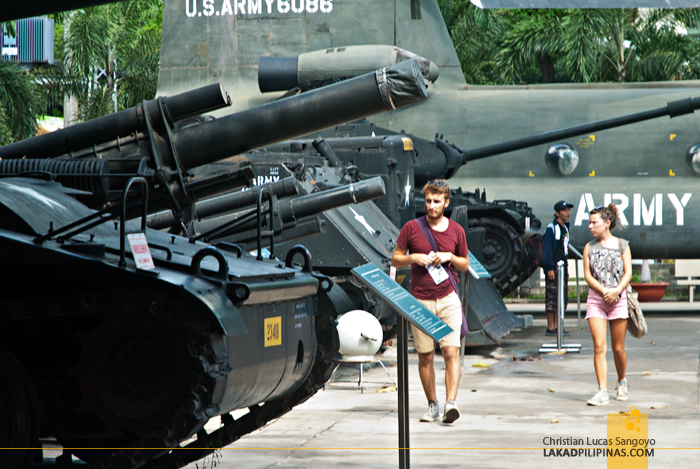 Outside, there are actual US military equipments used during the Vietnam War; helicopters, tanks, aircrafts, and even bombs. The latter has, of course, already been fully diffused. 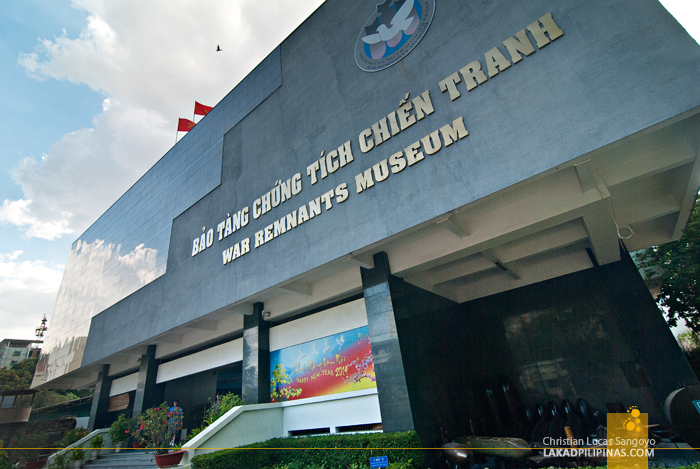 Inside, the museum holds numerous relics of both the Vietnam War and Indochina War with the French. But mostly, it’s about the horrors committed by the Americans against the Vietnamese people. 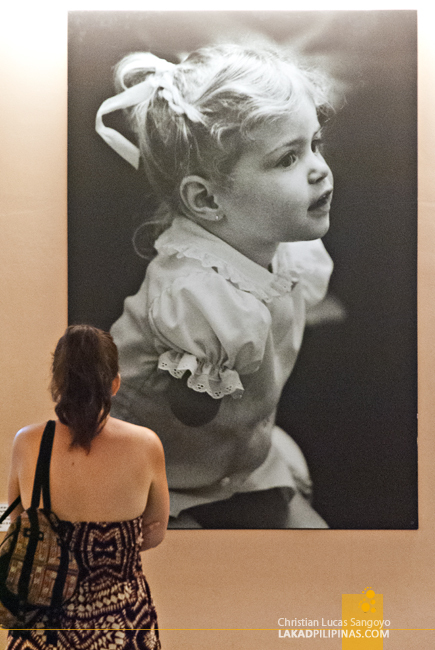 Photographs depicting these are aplenty throughout the galleries and some can be outright upsetting for the weak-hearted. I’ve seen not a few tourists, surprisingly, even Americans, tearing up while viewing the gallery; although I’ve also heard some low mutterings how one-sided the exhibitions are. 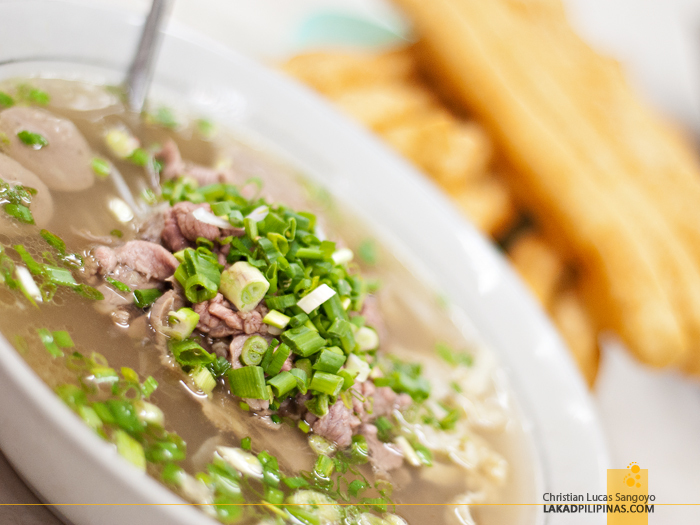 There are numerous stalls, restaurants, and eateries you’ll pass after visiting the museum, heck there’s even a Jollibee nearby, but since we were looking for something legit, we went straight to Pho Hoa Pasteur. 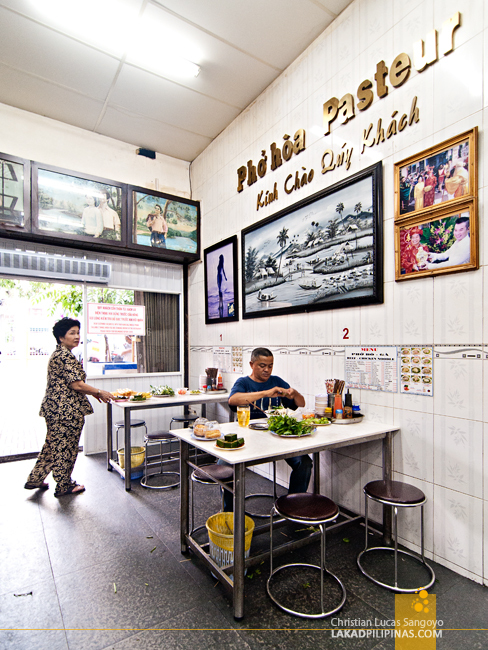 A friend was gushing how good their pho was and how it was the best pho in Ho Chi Minh. And since it is within the area, albeit a tad out of the way, we sacrificed fourteen minutes of walking to reach it for an early lunch. 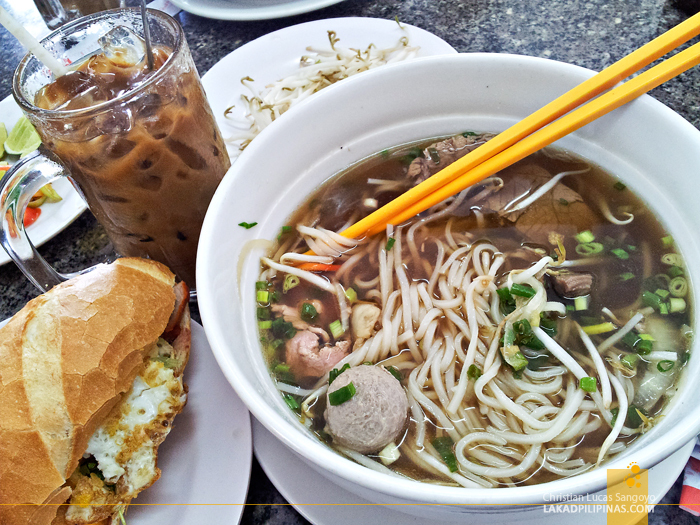 Passing a menagerie of hip boutique shops and restaurants on Pasteur Street, we eventually arrived at Pho Hoa, an unassuming noodle house that has absolutely no relation to the famous Vietnamese restaurant in the Philippines. We ordered pho, of course, and it came with a serving of dau chao, a longish fried bread stick that’s crispy on the outside and soft inside. The noodles, my friends said, was absolutely heavenly. Me, more of a banh mi person really, couldn’t find any difference from those I’ve previously tried. Lol. 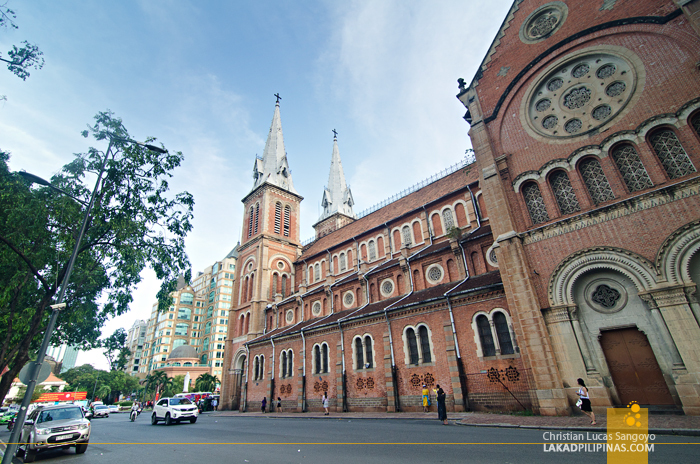 Some fifteen minutes away from our lunch place, we came upon the back of the massive Notre Dame Basilica in Saigon. The massive Romanesque brick structure has a symmetrical facade with two belfries rising to a height of 190 feet set with six bronze bells each. Constructed by the French colonist in 1863, most of the materials were imported all the way from France, with its brick outer finishing coming from Toulouse. 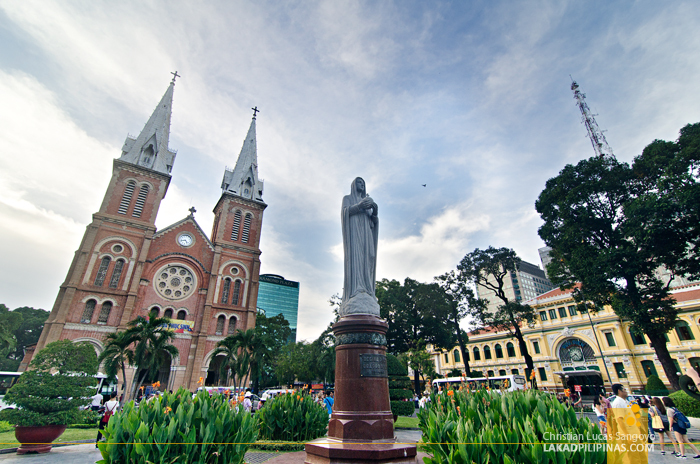 In front of the cathedral stands a Marian statue which was said to have miraculously shed tears on its right cheek in 2005. 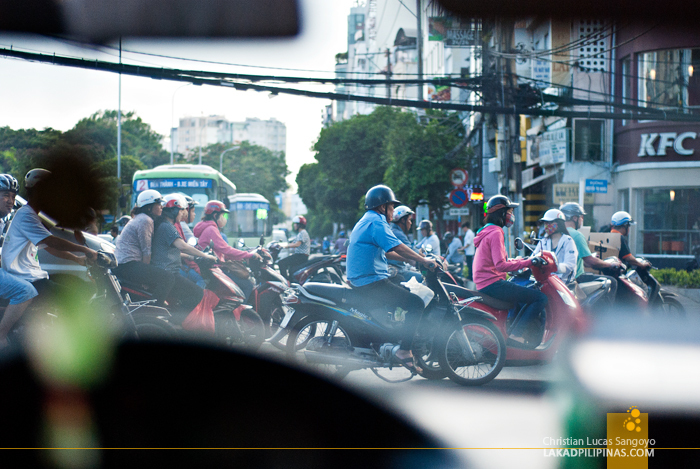 You can just imagine how traffic stood still as this happened, considering how congested Saigon’s streets are. The impression one gets when viewing the cathedral from the parallel street is nothing short of overwhelming. It is so massive one cannot help but feel dwarfed beneath its shadows. 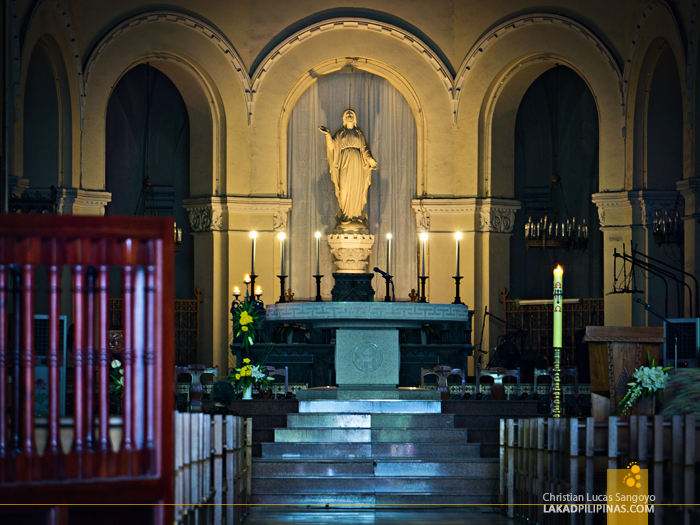 The church is actually still in use but is closed to the public on certain hours. Unluckily for us, we arrived just as its gates were closing. 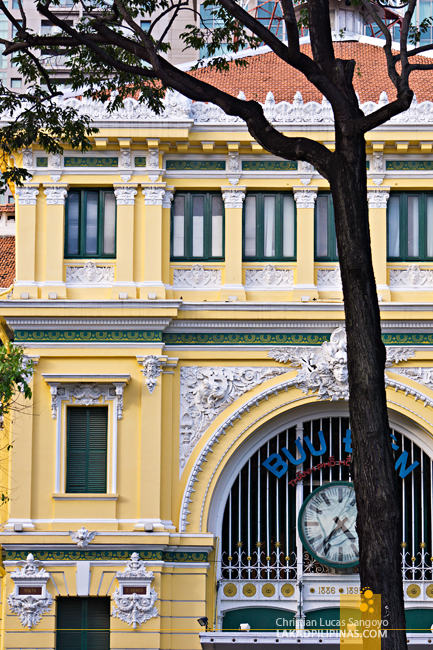 Right across the cathedral is Ho Chi Minh’s celebrated post office. What’s so special about a post office, you might ask? 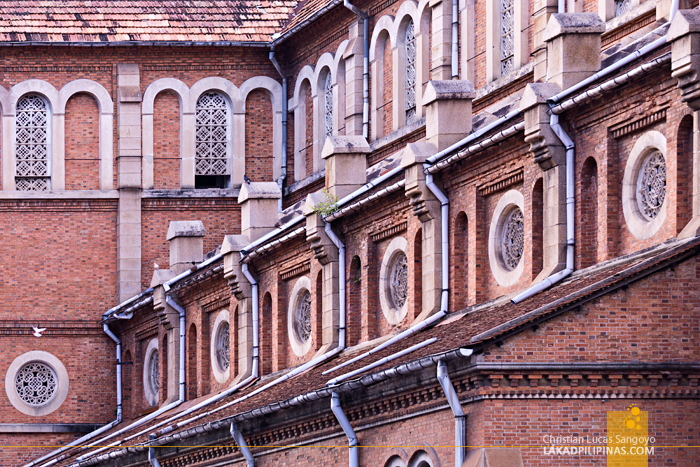 The building is part of the French conquest of Indochina. It was built about twenty years after the cathedral and has a certain Renaissance and Gothic feel to its facade. And this, it has retained up to this very day. Inside, the halls are filled more with tourists and vendors hawking souvenirs than, I guess, actual customers sending out mails and parcels. 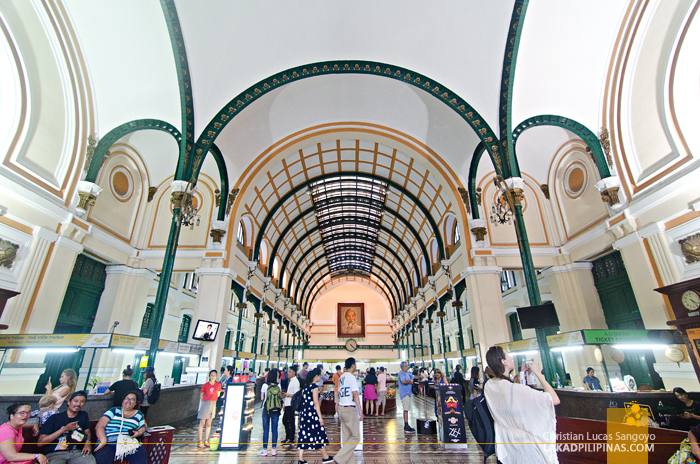 Its interiors are as impressive as its exterior; arches and barreled ceilings above, colorful old tiles below. Two noteworthy things to consider seeing when visiting are the painted maps of Southern Vietnam and Cambodia on the left side of the building, and Saigon, on the right side. These are original paintings done after the building has been constructed. It is interesting to note that famed engineer Gustav Eiffel has often been mistakenly credited in designing the structure. 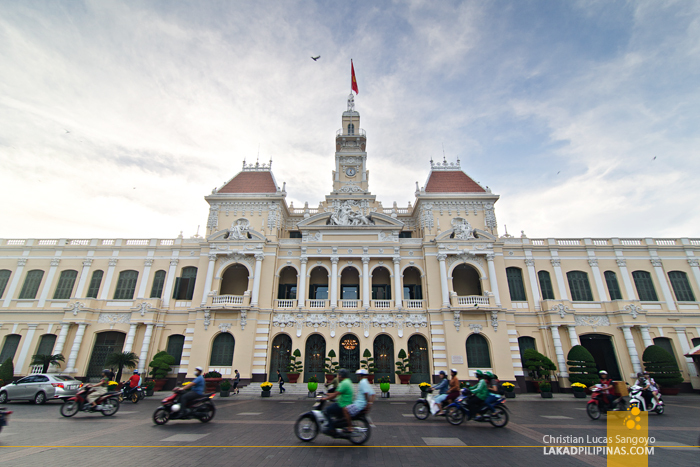 A few blocks away from the cathedral area is the sprawling Ho Chi Minh City Hall. 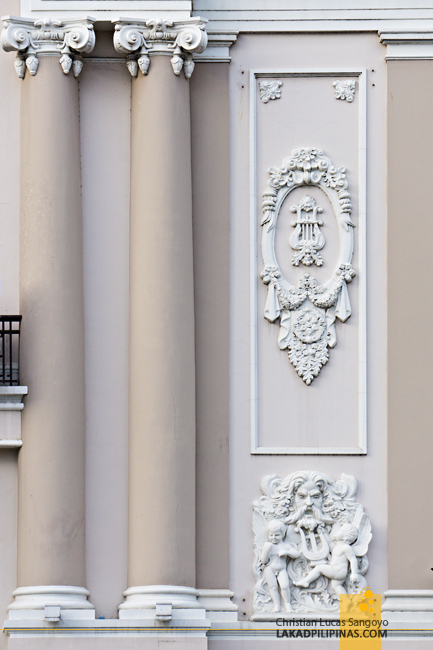 The wide French colonial building, built in 1902, isn’t really open to the public, but admiring its symmetrical facade from across the street and the plaza beyond is a good enough stop for the city tour. 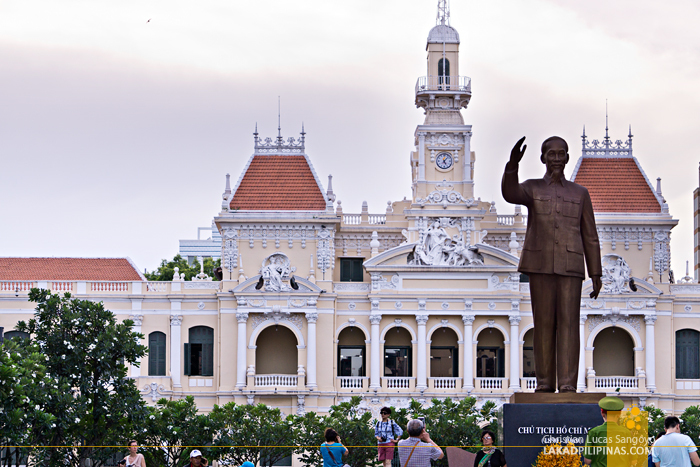 On the long green open space in front of the city hall, stands a larger than life statue of the man himself, Ho Chi Minh, guarded by green-garbed don’t-mess-with-me-stanced officers. 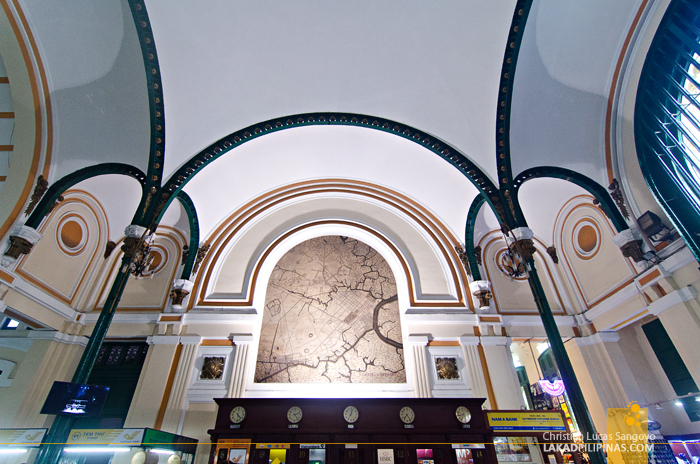 And the last for our French colonial building tour is Ho Chi Minh’s Municipal Theater. 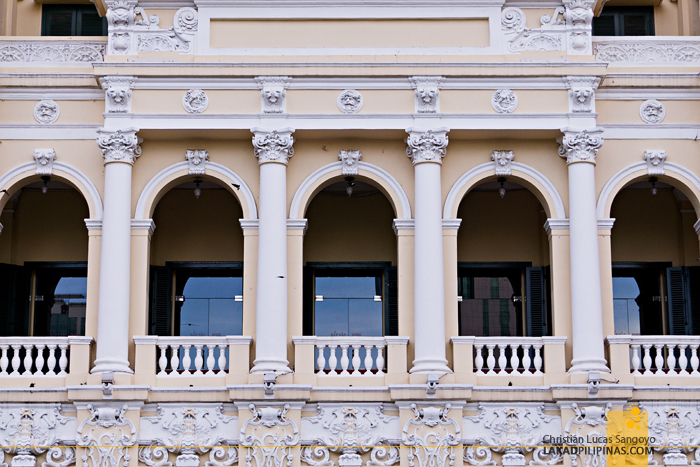 Popularly known as the Saigon Opera, the building was constructed in 1897 as an entertainment venue for the French colonists. 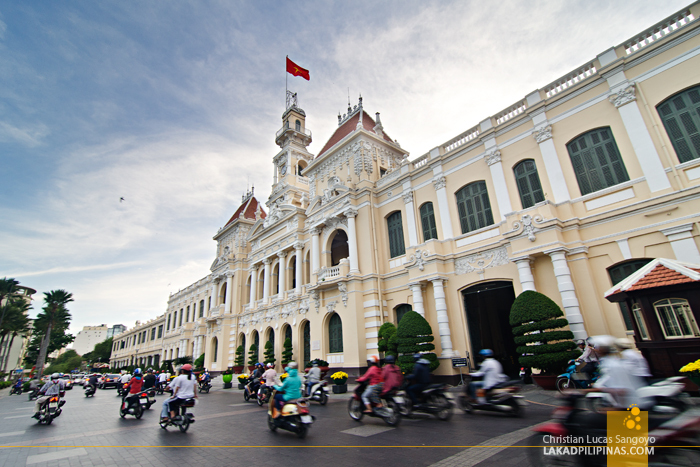 It is said that it is the counterpart to the North’s much grander Hanoi Opera House. It originally can seat up to 1,800 people, but has now been reduced to 500 souls. The building has seen its fair share of the war, being bombed by Allied Forces during the Japanese occupation of Vietnam in 1944 which led to its closing. 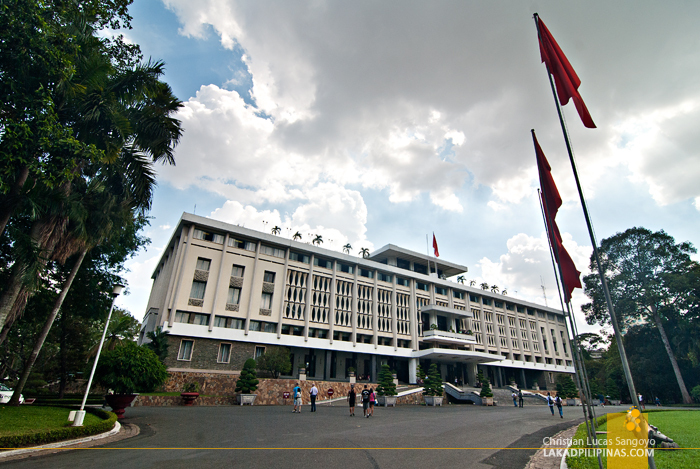 It opened its doors once again eleven years later to be used as the seat of the Lower House of the State of Vietnam, and afterwards, the Republic of Vietnam. 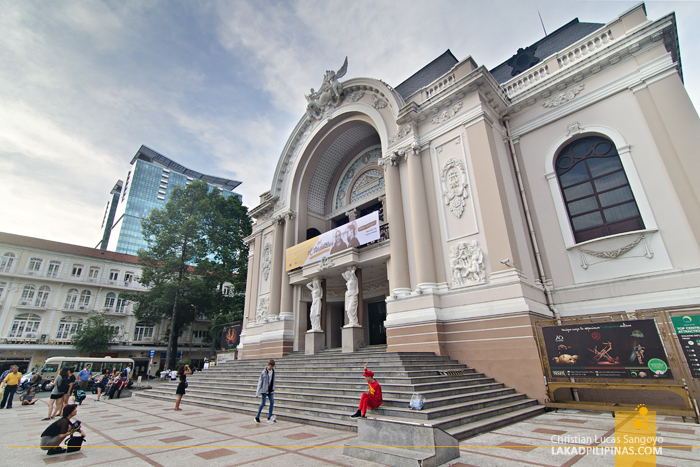 After Saigon fell to the north, the theater was again used as intended, and during our visit, the place was even used as a venue for a popular Electronic Dance Music act. From Shakespeare, to politics, to EDM. Lol. 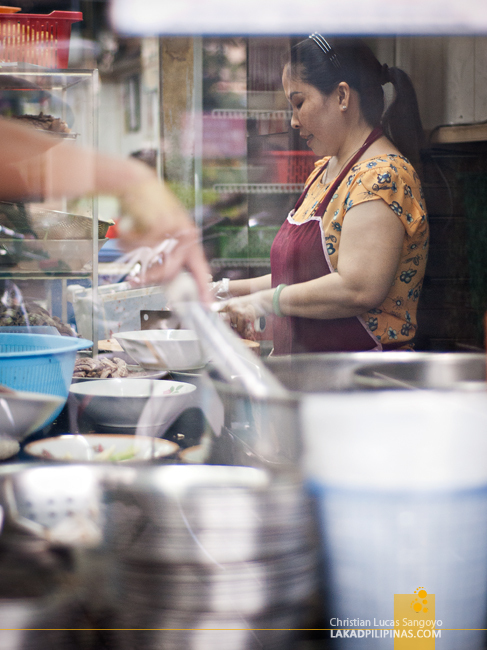 Circling back to where we came, we visited the oldest market this side of Vietnam, Ben Thanh Market. 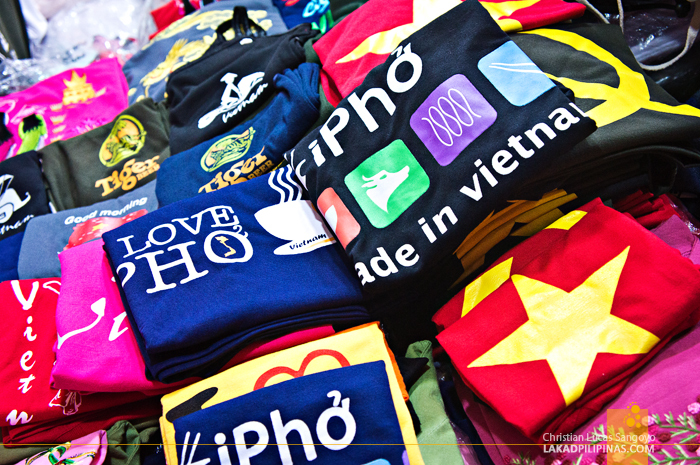 The market came about from various vendors that used to hawk their wares near the Saigon River. When the French colonists came to Vietnam, they built a formal market for the people, but unfortunately, this was razed by fire in 1870. 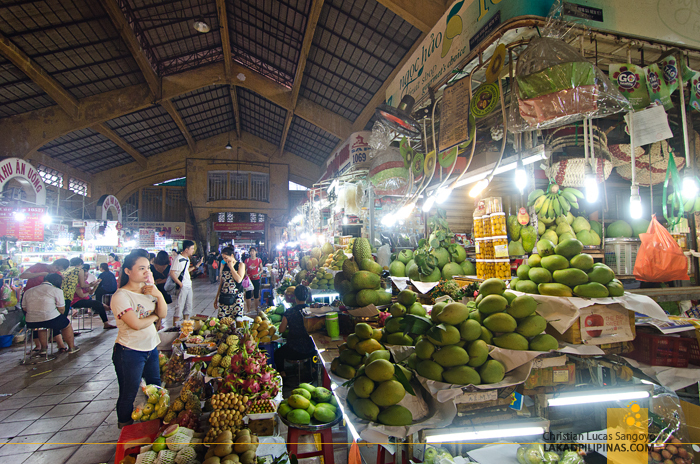 Afterwards, they built a new building for the market, which is currently the Ben Thanh Market that we see now. 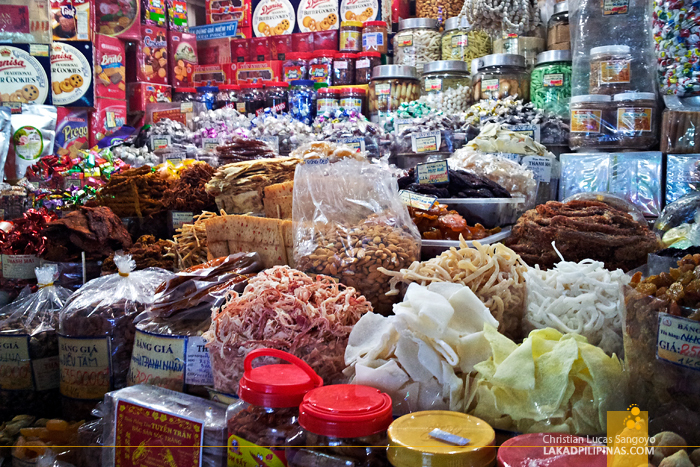 Inside, one can buy all sorts of souvenirs and food to bring back home; textiles, handicrafts, dried fruits, trinkets—they have it all. Come nighttime, the market spreads out to the adjacent street, forming a sort of night market complete with food stalls selling pho and other local Vietnamese dishes. 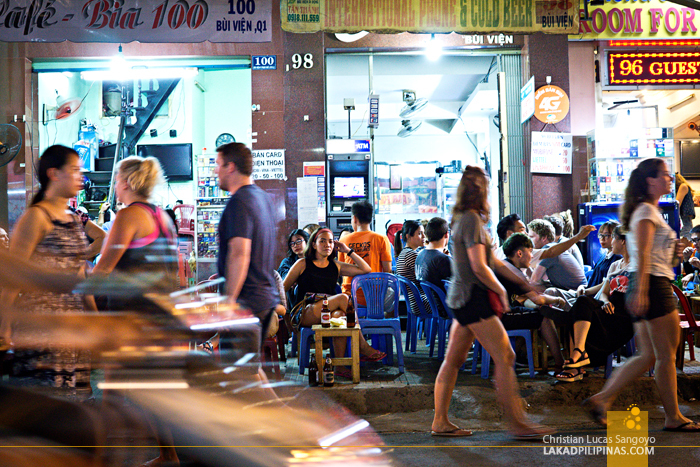 And finally, as dusk settles over Saigon, we head over to Bui Vien Street near the backpacker district of Pham Ngu Lao for a taste of Saigon’s nightlife. During the mornings, this is a shopper’s haven, with its quirky boutique stores selling cool shirts and propaganda posters, but come nighttime, the sidewalks start to fill with low stools for beer drinkers and revelers. 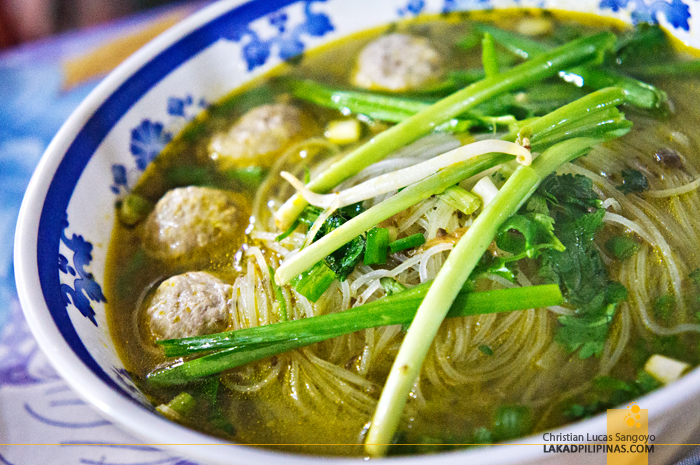 Bui Vien is comparable to Bangkok’s Khao San Road, Phuket’s Bangla Road, and Siem Reap’s Pub Street—only much rowdier and more localized. Surprisingly, there are a lot more locals hanging out at this place than foreigners, which is very refreshing. 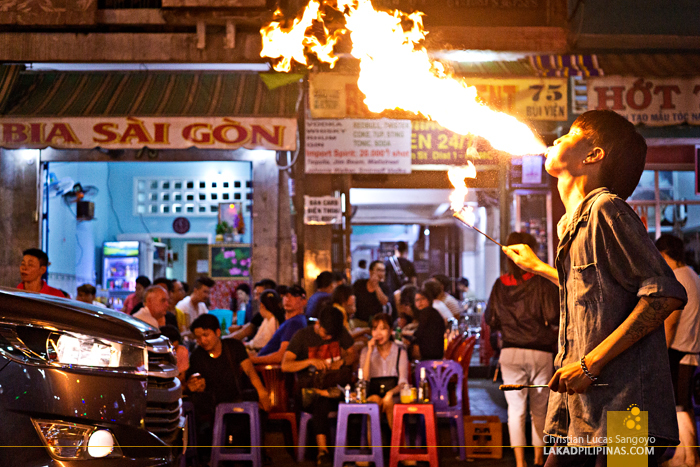 And indeed, Saigon’s pub street is much, much wilder than its counterparts; along with the endless queue of motorcycles roaring across the road, the scene is interspersed with solo dancers blocking the traffic, snack vendors hawking local Vietnamese streetfood, and fire-breathing performers lighting up the road with their flame-throwing mouths. It used to be, store owners just spread out mats on the sidewalk floor and people would sit right in and drink sprawled over the floor. 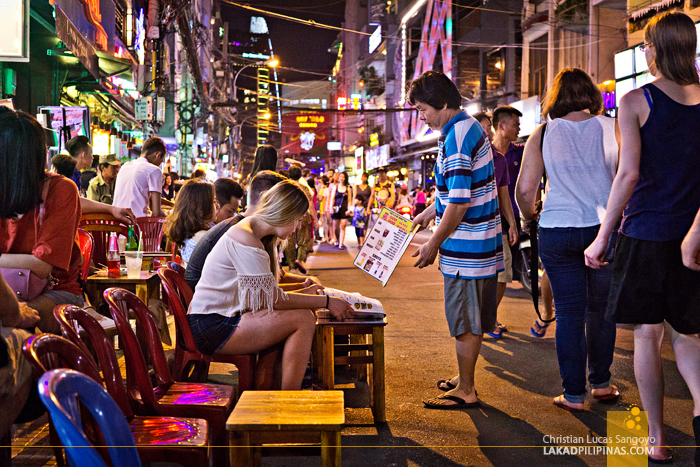 But now, they provide low stools for drinkers to sit on—which they remove every so often as police cars pass by, then the fun continues once again. 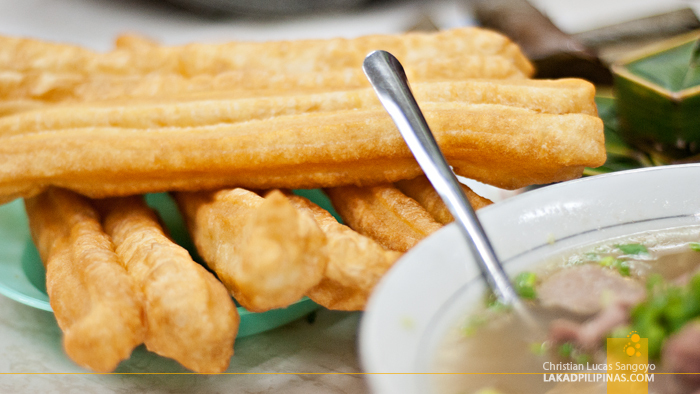 There is absolutely no better way to finish your Ho Chi Minh day tour than at Bui Vien. You can even extend it until the wee hours of the next day! 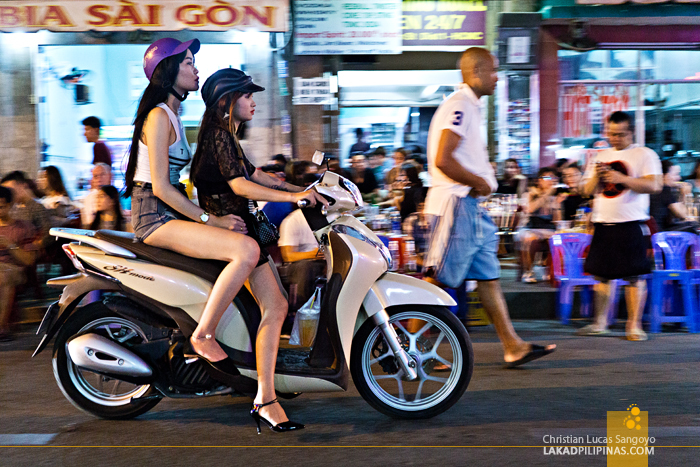 Those girls on a motorbike!